Drag queens in cotton candy wigs and aerodynamic heels strutted in to its massive atrium for the third annual RuPaul’s Drag Con at the Javits Center in New York. Just two flights down, quite a different scene was unfolding. Lined up patiently on the cavernous subterranean level, men with glasses and bookish women carrying tote bags stood quietly, starring at their phones, waiting to listen to podcasts. 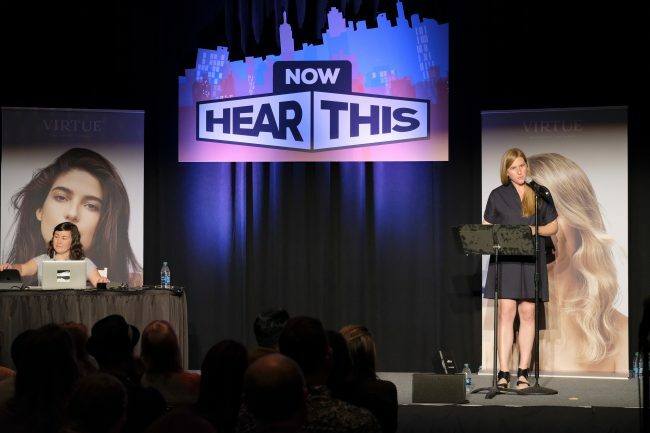 The second annual Now Hear This Podcast Festival, which took place for the first time in New York City, September 8-10, hosted 28 live podcast recordings from various networks including Earwolf, Radiotopia, Feral Audio and NPR. A mix of comedy, true crime, storytelling, sports podcasts and more, the weekend boasted an impressive 20-plus hours of content. 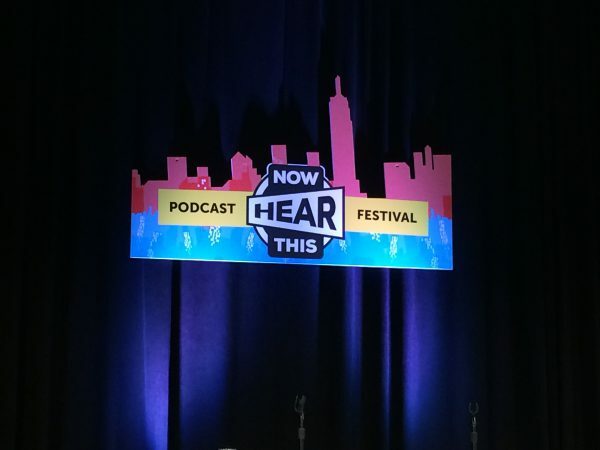 Bringing your favorite podcasters in to the room with you, with hosts like Larry Wilmore, Jason Mantzoukas, Levar Burton, and Phoebe Judge, the festival took the audio medium and made it visual. Giving corporeal shape to the disembodied voices from the internet, the forum commenters, and the unheard laugh tracks, Now Hear This managed to capture the ephemerality of the internet. For those who missed it, or preferred to skip the expense in favor of listening to the podcasts when they come out on iTunes for free, Royal Flush spent the weekend going from recording to recording to give you the best, worst, and all the other moments you need to hear now. The weekend kicked off with the debut of a new podcast from Jon Gabrus and Lauren Lapkus. 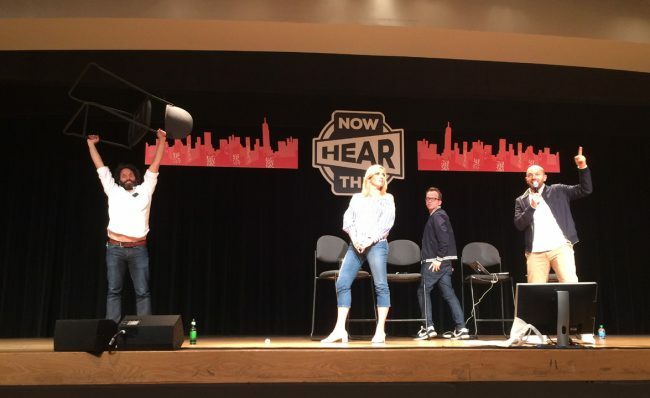 Premiering this fall on Earwolf, “Raised By TV” delves into the comedians’ obsession with and nostalgia for 80s and 90s sitcoms (the live recording was a fantasy football-style draft of TV sitcom families). Whether or not you once lived for the will-they-won’t-they drama of Ross and Rachel or planned your Friday night around the TGIF line up, Gabrus and Lapkus’s enthusiasm makes this must-hear podcasting. Dissecting and reviewing bad movies, How Did This Get Made hosts Paul Scheer, Jason Mantzoukas and June Diane Raphael were joined by special guest Chris Gethard (“The Chris Gethard Show”) to give their commentary on the Neil Diamond-laden, 1980 film, The Jazz Singer. The film, and Diamond’s acting, both fell flat (or “on the rocks” you might say), but the podcast was an instant hit. Criminal, the true crime podcast hosted by Phoebe Judge and Lauren Spohrer, made for a riveting live show. Detailed reporting was distilled into short stories about police dogs, the history of fingerprinting, and a notorious streaker, all narrated by Judge in her calming, quietly knowledgeable NPR voice. An unexpected palate cleanser, the carefully scripted show was a nice change of pace after several improvised comedy podcasts. 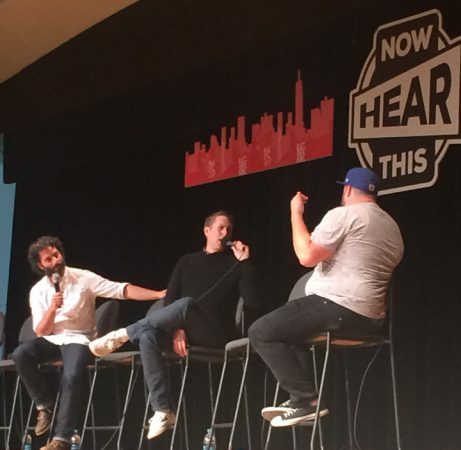 For the uninitiated, Comedy Bang Bang, the long-running podcast hosted by former “Mr. Show” writer Scott Aukerman, is a mix of interviews plugging actor/comedians’ upcoming projects and off-the-rail conversations with improvisers playing insane characters. Billed as the main event Saturday evening, the packed show featured fan favorites including Jason Mantzoukas (The House), Jon Gabrus (Guy Code), Jessica McKenna (Off-Book podcast), Anthony Atamaniuk (The President Show), and Paul F. Tompkins (Bojack Horseman), and ended up running two and half hours long, leaving the audience contentedly exhausted and reeling with laughter. Appearing on three podcasts each Jessica McKenna (Off Book, Hello From the Magic Tavern, Comedy Bang Bang) and Jon Gabrus (Raised by TV, High and Mighty, Comedy Bang Bang) were Now Hear This all-stars. Upright Citizen Brigade (UCB) alumni, the comedians’ improvisational skills are incredibly sharp. Even in a jam-packed Comedy Bang Bang, Gabrus’s quick wit made him stand out in the crowd, and McKenna managed to steal the show at the last minute, improvising a rap filled with so many perfect call backs. Hosted by comedians Mike Mitchell and Nick Wiger, Dough Boys, which reviews chain restaurants, appropriately recorded at the brunching hour on Sunday. Though the subject for their review, Guy Fieri’s Times Square restaurant lent itself to entertaining ridicule. Overall the comedian’s obscure Zelda and Star Wars references made the podcast feel like it was intended solely for an audience of dudes (aka guys who are playing video games regularly into their thirties and own one too many graphic tees). Though it has a huge following, without the same frame of reference as Mitchell and Wiger (or in other words as a female listener), it felt undercooked. Breaking down the complicated science of astronomy, physics, and other secrets of the universe, Star Talks is hosted by a variety of astrophysicists including the layman’s interpreter of the cosmos and director of the Hayden Planetarium, Neil Degrass Tyson. Though the panel of experts were well-credentialed (Tyson himself did not make an appearance), once they uttered the words, “We’re going to talk theoretical physics,” like a shooting star, this reporter was gone. The real highlight of the festival was not a single podcast or personality, but that it managed to bring together faceless crowds from the anonymous internet to form an IRL community—there was even one group of people who met for the first time in person after talking for years on the Earwolf forums. There was a shared language and frame of reference as people casually referred to comedians in shorthand and shared an unspoken dress code—for example, there were no less than 10 Hey Nog Man t-shirts floating around (a reference to one of the several in-jokes from Comedy Bang Bang). Anywhere else the assumed familiarity with the on-air hosts and detailed podcast knowledge might be a source for embarrassment, but not at the festival, where it’s the unabashed norm.